Anybody that followed our haphazard route around Argentina will atest to the fact that it didn't always make the most sense. Long bus journeys and a tricky economy meant that weeks had to be lopped off our itinerary and we simply didn't have the time to make it to the number of places we originally intended to visit. No gauchos in the Pampas, no to the popular city of Cordoba, and most disappointingly, no to the wine region of Mendoza. It wasn't until a late night in Paraguay, flicking through the Lonely Planet whilst attempting to come up with a plan that we stumbled across the page on Cafayate. Clearly the Gods were looking down upon us - they we leading us to Argentina's other great wine country! Located in the north east of this vast country, this dusty city feels a million miles from the Argentina that we had come to know. Verdant green vineyards backed by imposing red rock and actual tumbleweed rolling down main street. The birthplace of Torrontes, and home to more than a handful of excellent bodegas, you could be forgiven for spending all your time propping up a bar sipping from carafes, however, there is much more to Cafayate than just dry heat and cold wine. From discovering the stunning landscapes of the Quebrada de las Conchas and gobbling up the tastiest tortillas rellenas to cycling the dusty backroads and hiking to hidden waterfalls - you may just find that you fall a little bit in love with this beautiful part of Argentina. Whilst we missed Mendoza's Malbec and Patagonia's Pinot Noir, we were delighted to pass through a region famous for its Torrontes - a dry but fruity white wine unique to Argentina. And what better place for our first taste than a bodega responsible for its production. Dotted throughout the beautiful region are tens of wineries and thousands of acres of vineyards, many of which open their gates to the general public. For the wine lovers amongst you, a trip to Cafayate means hours spent sipping reds, whites and rosés - just how many depends on your budget and how you intend to get around. Whilst the grapes are harvested outside of the town, for those on two feet or with little time to explore the area, there are a number of the popular bodegas offer tastings within walking distance of the town centre, including Bodegas Nanni, Bodegas El Tránsito and Bodegas Domingo Hermanos. However, in order to get out to the vineyards and the remaining wineries, you will need a car or a bike. The most highly recommended are El Esteco, El Porvenir de los Andes, Finca las Nubes, Amalaya, Bodega Etchart and Bodega Piatelli. Our purse strings were pretty tight at this point in our trip, so we were only able to visit the bodegas offering free wine tastings. 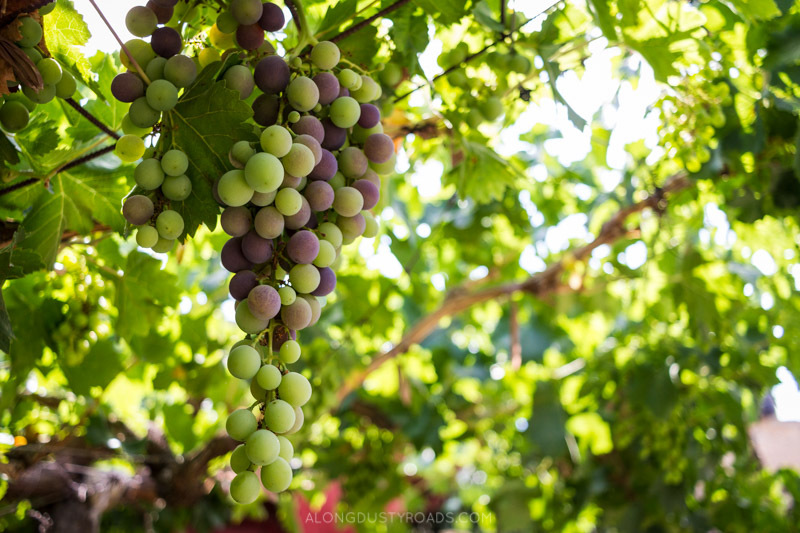 So, if you've got a little cash to spend or simply love wine, why not check out this post, or this one, or this one to get a better idea of where to go and how much it will cost. And, even if you aren't able to go to all the tastings, we'd encourage you to take your bike out along this route - when the vineyards are in bloom, it is simply stunning! Red rock reminiscent of Arizona or the Australian outback, empty winding mountain roads and vast blue skies - there's a reason to get on your bike in Cafayate! Whilst there are many tour companies in town which will drive you along through the famous Quebrada de las Conchas, the real adventure is negotiating it with two wheels. Now, we're not saying it's easy (especially on a hot day), but we we promise you you won't regret it. Bike rental is available in a number of hostels but we've heard a lot of stories about dodgy bikes and unfixable punctures kilometres from home, so we'd recommend picking up a cycle at one the reputable rental places in town. We rented our bikes from Majo Viajes on the corner of Vicario Toscano and Nuestra Senora del Rosario and we're very happy with the quality. A full day costs $250 pesos as of May 2016, whilst half day rentals are also available. Now, you could be completely crazy and cycle both ways, but the sane approach is to hop on a bus to La Garganta del Diablo and cycle back. They are used to tourists taking bikes on the route, so just ask to store it in the hold before you board and the stop (where most tourists will be getting off) is announced. At the time of writing, a bus tickets was $50 pesos with buses at 8.30 a.m. and 10.30 a.m from one of the small terminals just a few minutes from the plaza. It's around 50 km, and mostly flat or downhill on the way back into town and expect to spend the vast majority of your day out on the bike (there are so many photo opportunities!). Also, be sure to bring plenty water and snacks. If you don't fancy a 50 kms bike ride, then you can actually see some of the most impressive aspects of the landscapes from the comfort of your bus seat - it's the same bus which brings you up to Salta! When we discovered that some very clever person had combined wine and ice-cream, we just knew we had to try it. There are a number of heladerias in town offering their own take on the local torrontes and malbec, but those in the know head to Heladería Miranda. She's the genius who first concocted the mix, before a number of copycats quickly sprung up all over town. Just be warned - this is not like chewing on a wine gum. These ice-creams are not just flavoured with wine, they are like having a glass! And bloody perfect after a long, hot, sweaty day out on the bicycle. Located just 6 km out of town is the entrance to the Rio Colorado. Popular with locals and tourists alike, a hike from here leads you to a number of waterfalls - perfect for cooling off if, like us, you're in Cafayate during the hot summer months. To get there you have a couple of options. Either walk/hitch hike the 6 km to the entrance, or hire a bike - just make sure you start nice and early. The track is composed mainly of gravel which, combined with its steady incline, means you're already pretty sweaty before you've started your hike. At the park entrance you will be met by a handful of young men all offering their (non-mandatory) guide services. It is debatable whether you need one of these, but some travellers have reported that the hike was easier to negotiate with one. We were quoted $40 pesos per person, others $50 per person (as with anywhere, it's always worth bartering to ensure a fair price for everyone). A little further along the path, you will be asked to sign in to a book, give a small 'voluntary contribution' and there is also some space to lock up your bike. Unfortunately for us, we didn't rent our bikes long enough to cycle the 6km there and back plus the four hour hike (our hostel guy didn't mention that the hike took so long) - but we'd still recommend it on a hot summer's day. Make sure you wear decent shoes as there as a number of spiky thorns along the route and, as ever, bring plenty water, suncream and some snacks. Despite our best efforts to locate these elsewhere, it seems the tortillas rellenas (literally, tortillas stuffed with cheese and occasionally ham) can only be found in the north west of Argentina - which is an excellent excuse to stuff yourselves silly with them whilst you're in Cafayate. However, instead of settling for just any, we'll let you into a little secret. Head to the corner of Av. Gral. Güemes Norte and Sevilla after 5 p.m. ish in the evening and you will find an old woman who happens to make the best ones that we tried! Plus, they're bigger and cheaper at $8 pesos each. 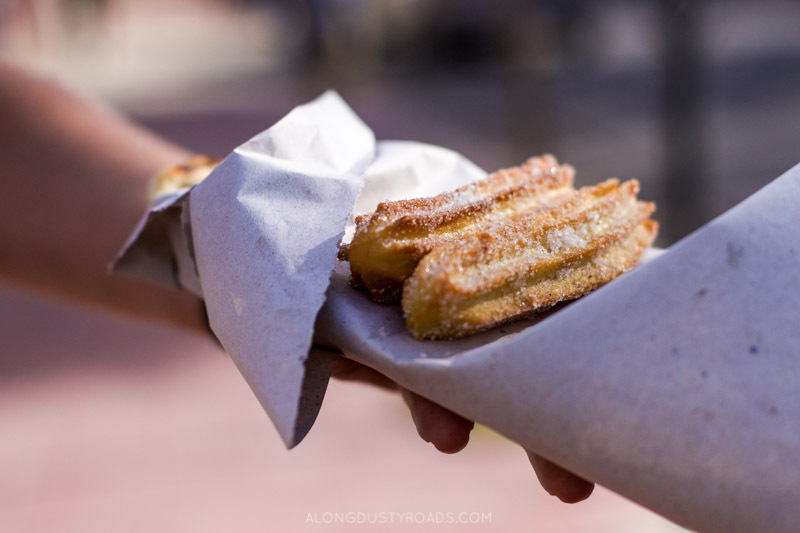 She also happens to sell the most AMAZING churros - you can thank us later! Choose to sit in one of the many restaurants lining the pretty plaza or find your own quiet side-street café - you'll struggle to stop at just one! Well, you are in wine country after all. Budget tip: Medium carafes of wine can be found for around $35 pesos if you get away from the plaza where they prefer to serve wine by the bottle. PLAN MORE ADVENTURES IN ARGENTINA!